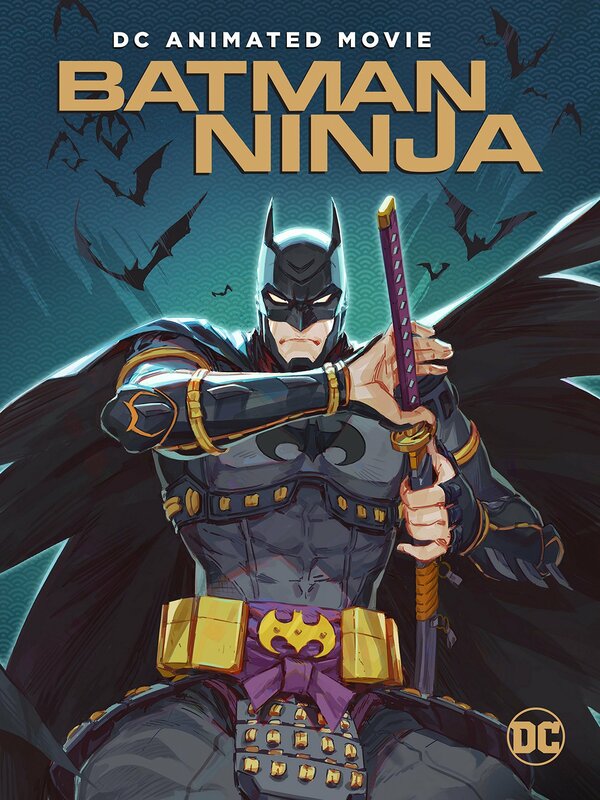 This is a tribute to Batman Ninja. Batman definitely looked pretty solid through and through here. He came up with good plans and adapted to this older world pretty quick. I somehow don’t think Howard would have been able to do much adapting at all. These two are polar opposites and Batman’s built a career out of putting guys like Howard away. There’s nothing Howard can throw at Batman that would intimidate the Dark Knight in the slightest. Batman wins. Suggested by Random Batman is a great detective and an even better fighter. It’s fair to say that in pure hand to hand he may be able to match Broly. Of course, that’s only in a scenario where neither one of them are able to use any abilities or super strength. Otherwise Broly has the massive advantage here. What’s Batman really going to do against a legendary Super Saiyan like this guy? The correct answer is that he’s not really going to do much of anything. Broly’s way too powerful. 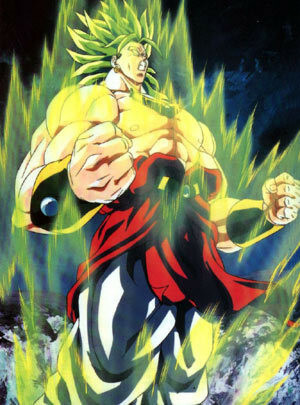 Broly wins. Suggested by Tej It’s time for Batman to step back into the ring. He has a GL Power Ring as well as Superman’s abilities so he’s a very tough vigilante. Then you’ve got Bisharp who is actually a pretty strong Pokemon with a solid design and a nice moveset. He was able to overwhelm Ash for a while which is no small feat. I think he’ll land a lot of good shots on Batman, but ultimately he doesn’t have quite enough speed to make up for Batman’s edge in strength. This is one round where the Pokemon will actually have to take a loss. Batman wins. Time to look at one of the strangest Batman films to date. This one goes for a very different look and even takes place in a different era than where Batman usually is. It’s a fun enough film, I think parts of it end up feeling more experimental than fixed, but it has potential. Either way it’s a fun way to spend 90 minutes and I’d be game for a sequel. 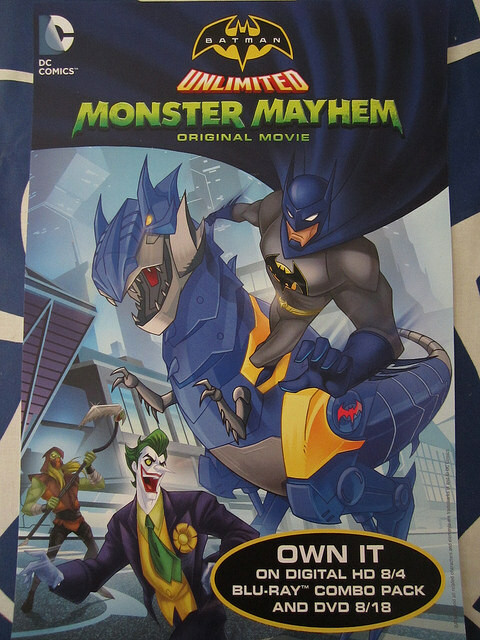 The film starts with Batman trying to stop Gorilla Grodd’s latest invention. It’s a time machine that he is planning to use to rule the Earth across all of its different eras. Batman blows it up, but this has the unintended effect of bringing him and everyone who was in range of the device into Feudal Japan. He is now in the Sengoku period and each of Batman’s enemies have commanded one of the territories. Joker naturally owns the biggest one. Batman will have to quickly get used to this period and make arrangements with local armies to fight back. He may even have to team up with Grodd, but can the ape be trusted? After that beginning the film does play out a little differently than I thought it would. I got the feeling that Batman was going to have to unite Japan and take out all of the villains. Of course, maybe it’s for the best that it didn’t go that way since each fight would have been really rushed. I’m ultimately pretty glad that Batman just ignored everyone else and ran to where Joker was. His Batmobile looks better than usual here as it has multiple vehicles built inside. It was too bad when they were ultimately broken. In general Batman looks pretty good here. I’m still not crazy about his design, but personality wise he basically made all of the right choices. Even if if the hostage was almost definitely fake and just Harley in disguise, that’s not a risk that Batman can simply make. In hand to hand he was doing quite good as well and his plans were on point. Even his quick period of self doubt was shorter than most as he quickly got back on the saddle. That’s definitely what I like to see from our lead. His array of Robins also show up and were fairly helpful I suppose. As always, Red Hood was definitely the most violent and intense of the bunch though. He was really willing to take Joker and Harley down for the count. Batman’s not up for murder like that so I feel like if that happened in the present he would have probably tried to arrest Jason. This just wasn’t a good time to do so. Catwoman looks all right as well. As always she basically plays the field until one side has the edge and then she makes her move. Things worked out pretty well for her so the plan was definitely her best option. There’s not much to talk about for the soundtrack but how about the animation? Well, for the most part it looks good. The character models are very detailed and there’s a high tech feel to the whole thing. While the fights can be a little blocky at times it doesn’t take away from the nice choreography. On the other hand, we do get one stretch of time for the farmer scenes where the budget completely dies out. I didn’t mind the video game type cutscenes when Batman says that he’ll have to do things like Feudal Japan civilians would as it’s a bit of a throwback. This artistic fadeaway style is something else though. The scenes just don’t look good and you start to feel like the budget is drying up real quick. Fortunately these are quick scenes though. There’s a lot of action to be found here. As soon as one fight scene ends you can bet that a new one is about to start up. There is rarely a few scenes in a row where nothing much is happening. With the short length this is basically a must so I’m glad that the film handled this well. You can feel a good amount of power behind each of Batman’s blows which is always important. He strikes with minimal movement as each blow is very precise. The film does a good job of getting that across. As for the villains, Joker is certainly the main one here. His voice will take some getting used to, but the character definitely gets a lot of respect here. He actually has Batman on the defensive a few times which is more than most villains can say. He actually looks really good during combat which is always nice to see. Grodd also looks pretty solid here even if he isn’t quite as impressive. He’s also a strategic mastermind in his own right so he shouldn’t be underestimated. The other villains don’t get a huge role though. It’s pretty much unavoidable, but that’s why this concept could have really worked for a full TV season or something like that. Having Batman tackle all of the districts would be pretty cool. Aw well, either way we did get a bunch of giant robots for some fights so that was pretty neat. Then the quick Bane vs Batman scuffle was also pretty intense. It’s always nice to see Batman bringing out a whole lot of tech like this. He’s a genius and with prep time you’d expect him to have a lot of tools at his disposal. We have to quickly talk about the ending though. It’s basically there for cool points, but makes no sense otherwise. So Batman…the guy who is always trying to hide his secret identity has decided that he’s had enough of that. He gets into a horse driven carriage that has Bat emblems all over it. Why would he draw attention to himself like that? It’s a moment that just feels really forced and I had to bring that up. Not a bad ending I guess, but in universe it just makes no sense. Overall, Batman Ninja is definitely a fun film. It brings that proper blend of being a super hero film along with some anime inspirations. The fights are good and there’s not much bad to say about the film. The animation could certainly be more refined and the character designs need some work, but as long as you remember this is an AU then that doesn’t even matter quite as much. If you haven’t checked this film out yet then I would recommend changing that. It certainly has a good amount of enjoyment to offer you. It’s time to look at this recent DC movie. Doomsday already got an adaption a long time ago, but now the New 52 lineup can give it a whirl as well. The animation and fights here aren’t quite as solid as the ones in the original, but I do think Superman got to use his speed a little more which is always cool. It’s a solid re imagining overall and will definitely have a lot of replay value for future watches. However, adding in the League also adds in a bunch of scenarios for the writers to have to deal with which the film doesn’t always put to full use. The film starts off with a meteor heading to Earth. It busts through a space ship and falls onto Earth. Doomsday walks out and begins his murdering spree. He wants to destroy everything on Earth and slowly makes his way to the cities. The Justice League begin to track him, but this could take a while. Meanwhile Superman is debating on if he should finally tell Lois the truth or not. He better hurry because based on the title he may not have a whole lot of time left to live. Could this be it for the Man of Steel? Surprisingly the first 40 minutes are used to focus on the Clark and Lois dynamic rather than getting us to the big fight. I think the Lois and Superman stuff have already been done to death, but I wouldn’t fault the film for it too much since I’m sure every writer wants a crack at this. Unfortunately I thought the film made Lois look really bad here. Granted, Clark isn’t in the right at every turn either, but my main issue is that Lois is just rather rude the entire film. She just doesn’t seem like a nice person and given how Superman is all about being nice it just seems a little off. Case in point, Lois has a co-worker named Grant who is always trying to dig up the dirt on Clark for her. She seems like a really nice friend even if she’s a bit nosy and is just looking out for Lois. She even buys Lois a coffee. I think you’re not supposed to like Grant, but honestly she was just a quality character. Look, the gossip mill at work will always be going. At least she lets Lois know what the others know and gives Lois the option to control the information a little. Lois just brushes her off along with the others in the hopes that nobody will find out but that door has already been slammed shut. She just isn’t very open to talking about it. I also think this is an unfortunate aspect of centering Lois’ character around the romance. It consumes all of her scenes when she is typically supposed to be busy being an ace reporter. It’s probably one of her weakest appearances in the continuity. Meanwhile Superman is nervous about telling her the truth which makes sense I guess, but if he’s getting serious about her then he should absolutely drop the bomb before the wedding. Doing it afterwards would just be super irresponsible. He was also a little too much at the dinner where he kept trying to silence his parents. The guy’s gotta be able to take a few embarrassing stories better than that. In fact, that would have been a good time to tell Lois that he was Superman. Would have been perfect to be honest. Well, the whole romance stuff certainly wasn’t the best, but the meat and potatoes of this is the fights anyway. Once the fights start they are definitely a lot of fun. It’s always cool to see Doomsday going up against the Justice League because that isn’t a matchup you get to see often. The fights with them and then Superman are basically nonstop action so the whole second half is just a lot of combat. It all looks really solid and the film doesn’t disappoint. While I did mention earlier that it’s not up to par with the previous adaption I think calling the animation anything less than great would be selling it short. It’s still excellent and the action is enough to recommend the film. Of course, I do think the Justice League seemed heavily nerfed throughout to make the plot work. That’s why sometimes films just cut everyone else out to avoid this issue. It becomes a case of if you’d rather have the audience suspend disbelief for no other heroes coming to help or having the heroes come and then be completely ineffective. This film chose the latter while the previous chose the former. Some characters like Hawkman are pretty accurate or if anything look too strong. That’s fine, but when we get to the big shots it gets a little tricky. Case in point, The Flash. 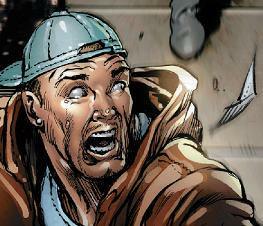 We see early on that Hawkman was able to land 2 hits that really sent Doomsday flying. Then Flash comes in and his attacks aren’t leaving a dent. When Flash goes at super speeds his hits actually increase in power tremendously. I think that’s one aspect of the Flash that is constantly overlooked, but at super speed he does have incredible amounts of super strength. That along with the Mace should have done considerable damage to Doomsday. Showing Doomsday taking a pounding and then adapting would have been good to see. Doomsday’s durability along with his regeneration is incredible after all and that would have made the fight so much better. Then Green Lantern comes in and basically just plays defense. He tries trapping Doomsday and then making a barrier. Both are poor options. Blasting him from the sky and flying around a ton would have been far better options. Then he is knocked out in one hit. Keep in mind that the fight starts off in the early afternoon and doesn’t conclude until late in the evening yet none of the Leaguers wake up. I think the most accurate member was Wonder Woman. She actually gives Doomsday a long back and forth fight where she dealt quite a lot of damage. She showed off her super strength and combat experience. 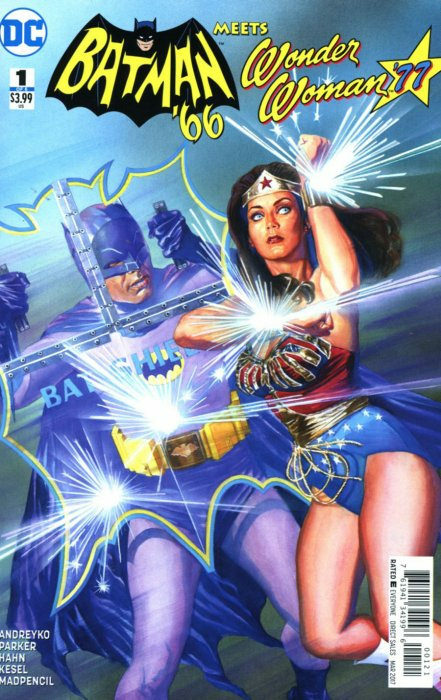 Superman will always be the real power hitter of the League, but I think having the others contribute in a similar way to Wonder Woman would have been good. Also, the League completely forgot about team work or even fighting at the same time. Every leaguer waits until the other member is down to start fighting. Hawkman comes in first, then loses. Green Lantern then shows up and loses. Then Flash shows up and loses, etc. Martian Manhunter, Cyborg, Aquaman, Wonder Woman, nobody ever teams up at all. They seem to insist on fighting Doomsday 1 on 1 which makes no real sense. It also doesn’t make sense that Hawkman and Green Lantern would both have time to fight Doomsday before Flash arrives on the scene. With his speed even after saving civilians he should have been the first one on the scene. I think the main issue was having Doomsday take down the League while staying believable. Depending on how he beats them you could argue that either Superman has no chance or he suddenly gets power scaled way above the others. I think doing the latter would work just fine. Superman has always been the strongest member of the League and I would argue that typically it is by a fantastically large margin. That doesn’t need to change. Showing the League hitting Doomsday with a bunch of combo attacks and the beast just refusing to stay down would have been very powerful. The film doesn’t even need to hold back on having him get extremely weakened or losing a limb or two and regenerating. It would show off his healing factor as well as his “adaption” ability. It would work similar to Amazo as their attempts to defeat him would only make him stronger. It’s a unique situation where they could show off all of the League’s talents and skills while still having Doomsday stay on top. I think that would have worked out really well and made the fight more realistic. Well, that’s enough on the power levels. It isn’t really anything that would hurt the film but always something I need to note. Also, the League took way too long in finding Doomsday. He started murdering people early on and even took out Atlanteans, but it took at least a day to find him. Really? They should have found him within an hour or so after that. Just put the Flash on his trail. By the time they find Doomsday he had already murdered quite a few people. Which the New 52 lineup could be a little off an on with how violent they are. The first installments are quite violent and after that they started to dial it down a bit. This one is a little more on the violent side I’d say. It’s certainly more violent than necessary as we see Doomsday crush quite a few people. Unfortunately this leads the film into the animal violence territory which was really unnecessary and definitely did hurt the film. A poor bear gets attacked by Doomsday. The scene has no purpose even within the narrative as we can already reasonably assume that he is stronger than a bear. If the film is trying to show that the food chain has been altered, that is rather obvious as well. All a scene like this does is take a star away from the film and lower its replay value. It’s a shame that the film had to mess up here. There are quite a few after credit scenes here to set up the sequel. Basically each of the Supermen get a scene. I think it would have worked better as one long scene than all of the various cuts though. Just one long scene that sets up the sequel. It’s less jarring than having a quick 3 second scene, cut, 3 second scene, etc. Still, it’s a good attempt though and the sequel should definitely be fun. I look forward to seeing the League deal with these guys. This time they’ll need to be more prepared for the fight though. 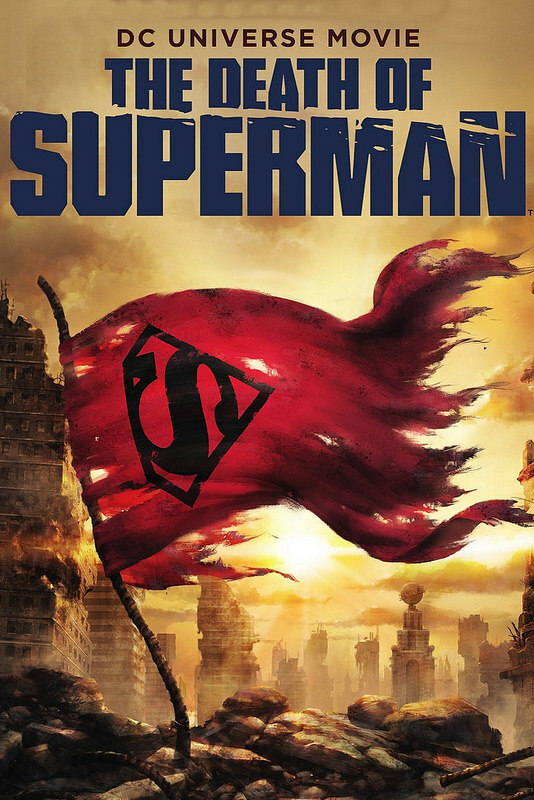 Overall, The Death of Superman was a pretty good film, but one that could have definitely been even better. You’ll surely enjoy the big fights with Doomsday and it is nice to have it as part of a longer continuity since you see cameos for the supporting characters like Damian and the Atlanteans. I do think the film may have brought too much baggage with it in the first half though and it should have been trimmed down to get us to the action a little sooner. I definitely still recommend checking this film out though. It’s a good action story with a lot of hype moments. The title basically spoils most of the movie, but I think it’s assumed that you know the plot going into this one. Batman Unlimited was a fun experiment by DC. 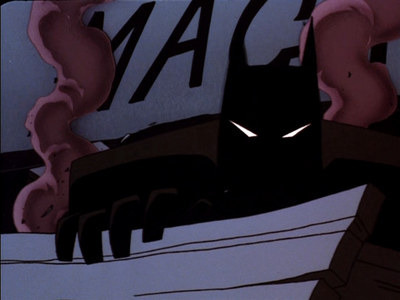 It’s basically what you get when you mix today’s animation with a far lighter 80’s Batman tone. The first two films were solid. On one hand the designs could use some work but on the other you are getting quality fights without having to worry about the film going all in with violence. This installment ends the trilogy on a high note as it is probably the best of the 3. It’s quite solid and I’ll miss having the gang around. The movie’s plot centers around the Penguin and Mr. Freeze. Freeze wants to stop some nearby ships and Penguin wants to rule Gotham. As such they form an alliance and Penguin teaches Freeze how to be more ambitious. The icy villain quickly becomes good at this. Meanwhile Damian is having a rough start as Robin since Joker humiliated him on TV. He is determined to get better though and this latest threat to his city could be a perfect opportunity. I’ve probably talked about this in previous installments but I really like how Batman Unlimited basically has nonstop action throughout. There aren’t many breaks for talking at all here yet the movie still does build up a very complete plot. Who doesn’t want to see Batman in a giant mech suit fighting a Godzilla homage? The concept of having robots vs monsters is certainly a classic one with Pacific Rim being the latest big film to bring attention to the genre. We also get traditional Batman style fights like the Arkham battle where Batman and Robin face off against the villain group. It’s a fight where you get the feeling they will lose from the start since it’s too early for the villains to be defeated, but it’s a fun fight nonetheless. Honestly I think the heroes were pretty well matched up against the villains. As always the animation is pretty solid. It looks like a main line DC film except for the fact that the character designs are quite different. Some can be a bit off putting, but at the same time I wouldn’t call them bad. 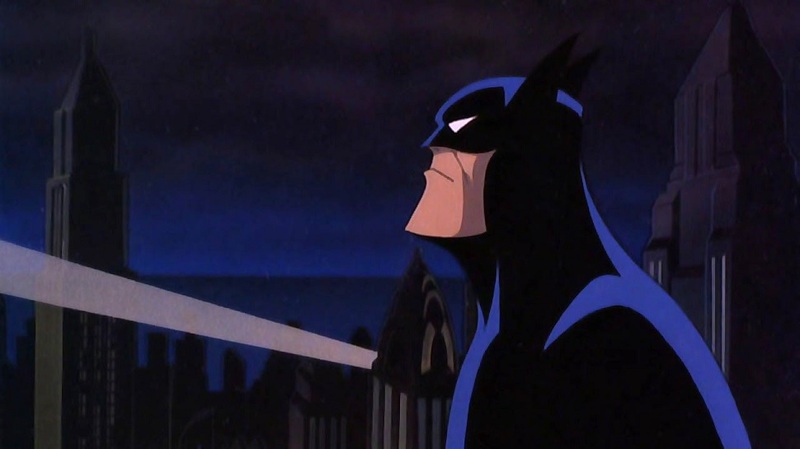 Batman’s (Bruce Wayne form) for example looks like something out of Space Dandy or Johnny Bravo. It’s a bit of an odd look for his Bruce Wane persona considering you’d expect something a bit more formal. Still, when you’re rich like that you can dress however you want with whatever hairstyle you want so it’s not as if it’s unrealistic or anything. Anything goes in that scenario. The fight scenes are pretty sharp with a lot of vibrant colors. I think with some fine tuning this could even be a decent basis for a Batman anime of sorts. The scenes when inside the mech could certainly work. There’s not much of a soundtrack so I’ll skip over that. Maybe the sequel would work on that. Green Arrow still gets shown up by Batman the whole time here. It gets to the point where I feel like he starts to acknowledge this by intentionally trying to sabotage Batman. Keep in mind that even if this is for humor such a stunt can easily cost lives when up against villains. Batman and Robin were getting ready to sneak up on the villains when Green Arrow broke through the glass which announced their presence. Somehow the villains didn’t hear them but you can still see what Arrow was trying to do. Additionally Arrow tries to prevent himself from getting one upped by ordering his own mech suit. Unfortunately for him it simply wasn’t strong enough to win any fights so once again he had to watch Batman come to the rescue. Green Arrow takes all of this pretty well though and overall I’d say that it was one of his better incarnations. It’s not all about power after all so as long as he’s still cracking jokes and trying hard that’s a start. Meanwhile Damian has his own plot about trying to stay out of Batman’s shadow. He’s the newest Robin as the others have all graduated and gotten their own titles. At first you may even think that he is Red Hood or Red Robin since the costume is basically the same but it turns out that it is Damian. This also helps tie in to the main titles where Damian is currently Robin. He’s a pretty good Robin. You can’t help but feel bad for him during the intro since losing to Joker while being recorded on the internet was a pretty hard blow to take considering it was his first real day on the job. He does his best to improve and study from there. Damian never makes excuses for himself and I’d say that he has a lot of potential if we do get another installment. Nightwing gets a small role near the end, but ultimately is just here as a cameo. As always Batman’s quite excellent here. He’s got everyone right where he wants them and reminds the other heroes that you don’t need powers to win fights. He’s pretty strict with everyone but never comes across as fair. I think Batman’s character is usually consistent in the movies and that doesn’t change here. He’s just as fun as he always is. As you can tell the character cast here was quite solid. I’d thank the writing for that. The film always seems to be on point and with its short run time the pacing is also good. As far as the villains go they were solid as well if not a little less impressive. I was pretty surprised to see Chemo since he’s pretty obscure, but it was nice to have him on board. Clayface and Chemo both get their giant monster fights, but don’t do much beyond that. Bane and Killer Croc have a big rivalry going which was fun. I’d probably go with Bane to win that fight ordinarily but it seems like Croc had the edge this time. I suppose since he also had an energy blast he was the more dangerous fighter. Those two were the highlights from the main villains. Of course Penguin is always fun though and is typically one step ahead of the other villains. Mr. Freeze is quite a bit different than usual. His character arc could be a bit cheesy as I think he just didn’t think his goals enough. I hardly see why he would want to help at the end even after Batman’s explanation. Sure, it wasn’t really his plan anymore but the end result was the same. For the villains with smaller roles Joker certainly stole the show here. He had some great moments including his final scene. It shows why you really don’t want to mess with him as a villain. It’s always going to come back to bite you. 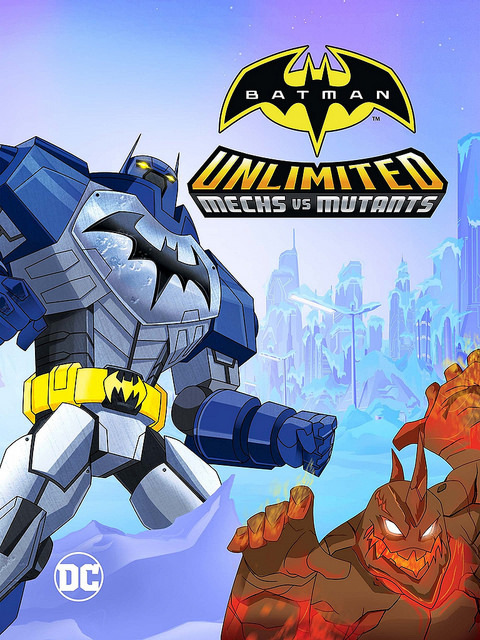 Overall, Batman Unlimited is most likely over with this film. It’s a trilogy that probably won’t be remembered very much by the fans but I’m glad that we got it. It’s certainly one that I would recommend and it really delivered on what the core of the project was…a good excuse to bring Batman and the others back for quality action scenes. Also the cliffhanger wasn’t all that exciting anyway so if the film decided to bring back Clayface it’s not like we would have missed much. 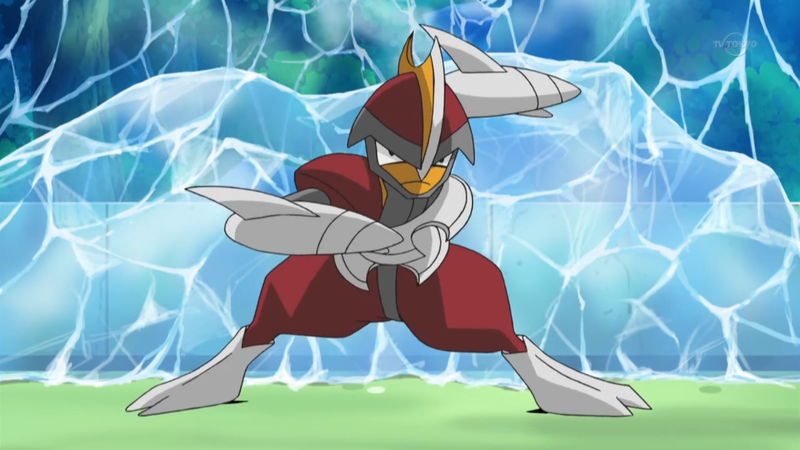 His abilities can make him a very dangerous opponent I suppose, but his fight scenes wouldn’t be quite as hype as the ones we got here. If we do get a Batman Unlimited 4, I want to see all of the Robins team up since Red Robin missed out on this adventure. It’s time to look at the Teen Titans GO! movie that came out recently. I’ve watched the show ever since its beginning and it’s always been very hit or miss. It can have some decent episodes and then it can have some truly terrible ones. As a result the show is leaning towards a negative rating at the moment, but of course things can certainly change by the end. With a film I figured the writers would try to be on their best behavior and come up with a good story so as not to embarrass its viewers. Well, the movie is a considerable step up and I can happily say that it was a quality movie. I was worried for a little while, but it all turned out okay. The film starts with the Teen Titans being mocked by the Justice League. While Robin and co. aren’t thrilled about this it’s hard to deny that the League have a lot more going for them. They’ve got big budget films on their resume while the Titans haven’t got a clue. Robin decides that the only way their group will ever be respected is if they get a big budget movie. They head over to Jade Wilson to plead their case but she explains that she’ll never make a film about them. The only way around this is if the Titans can get rid of all other heroes or finally get an arch nemesis. Both options will be tough for these guys, but Robin knows that it’s time to step up. Can the team do it? Slade gets a pretty big role here as you’d expect since he is easily the Titans’ most iconic villain. This film is the first time they’ve met in Go continuity so it was nice to see him arrive. He’s played in a much more comedic light here as you’d probably expect. It may take a little while to get used to him since his “Mind Manipulation” gimmick isn’t quite as humorous as most of the other Titans. Still, he does give us a pretty good twist by the end (Well, if you’ve read the comics you might not be fooled but the twist works to an extent regardless because there are two routes that the movie could have went with) and he can certainly fight. I was glad to have him on board here. Where the film excels is naturally in the writing/humor. See, typically the issue with the series is that the humor is cringy instead of funny. Usually it’s very crude or just flat out gross. This film rarely goes there and instead the humor is in how crazy the Titans are and how unprofessional the team can be. A good example of humor is how the Titans go around preventing everyone’s origin. The humor can also be a bit dark in how they have to murder some people without going too far into dicey territory. As I mentioned the only gag that drags on is Slade’s. (Saying his name gets old as well) When Slade isn’t around the rest of the humor is fast and to the point. I also liked the film’s soundtrack. Some of the songs were meant to be parodies of course, but they still worked very well with or without context. Robin’s song about being a real hero was awesome. Likewise I really enjoyed the Teen Titans opening song that was also used during the climax. It’s really impressive just how good the song is honestly. It’s the kind of song you could actually listen to in a serious context and still enjoy it. It helps that the graphics for both scenes with the song were quite impressive. It started the film out on a high note and right away you could tell that it was a bit of a step up from the show. Even the animation was quite on point here. While the style isn’t really different from the show, there is a lot more movement so I imagine that the animators had to use many extra frames. It allows for better visual gags and some nice action scenes as well. On a technical level the film had no issues and since the writing was solid as well you can see how this film got off on the right foot. As far as the main characters go, Robin is certainly the best hero just like you would expect. He actually knows how and when to get serious unlike the rest of the heroes. He got the team their opportunity to get a movie and didn’t mess it up unlike the others. He really wants to be a good crime fighter and is just held back by the others. I’d go as far as to say that without the others he would have already had his movie. Still, he’s pretty patient with the other titans and has all the qualities of a good leader. Unfortunately the other four don’t look very good here. They actively try to wreck his movie in a fit of jealousy and rage. You could argue that it is quite personal since right after Jade tells the Titans to stop goofing around they immediately did the opposite. I think the implication here is that they didn’t like the way she said it, but it’s still awful petty of them. Cmon now guys. You really feel bad for Robin the whole time and even if he does get suckered by the end you can’t blame him for trying. This was his life’s dream and he may not have gotten the opportunity again otherwise. You go Robin! Another strong area in the film is its ever changing plot. While getting a movie is the main focus of course the film goes into a few different segways where you think it may spend a lot of time doing something only to refocus. A good example of this is the heroes deciding to go back in time to change the superhero origins of the League to replace them. 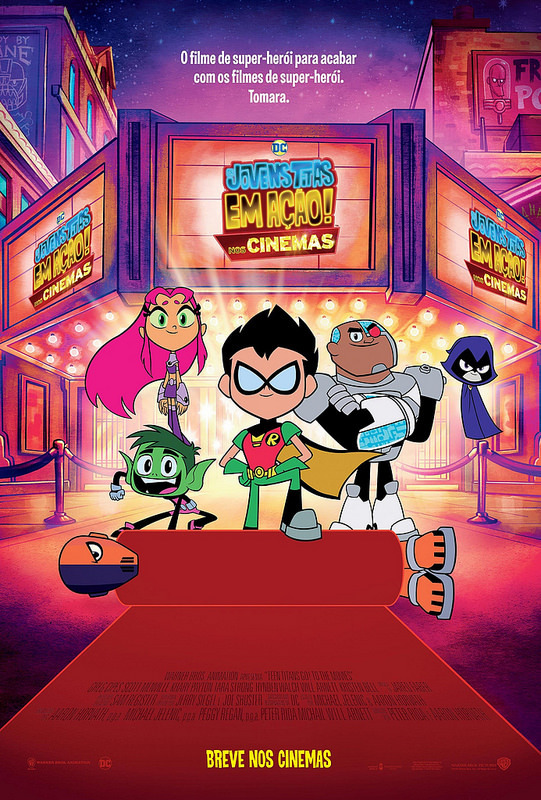 You’d expect this to be the bulk of the plot in any other movie but here this montage only lasts for a little while before the Titans go with plan B. I think that plot could have been its own movie as well, but the film could have potentially locked itself in a bit since then it would become a bit more predictable as to what would happen next. It still worked for the quick gags though. There’s just a lot happening in this film throughout and it has the kind of energy that you want to see in a movie like this. It embraces how crazy it is and ultimately ends up being the definitive comedy DC film. Of course this wouldn’t be a true comic book film without a post credits scene right? It hints at a future project to come if you take the scene at face value. Honestly I wouldn’t have taken it very seriously myself since it would be the ultimate gag to get everyone’s hopes and dreams up. Of course, we do have a rumored crossover film coming up which is similar to a direct sequel so I guess in a way that does lend some credibility to the scene. Regardless it is a pretty fun scene though and one that I’m sure you’ll have fun with. Overall, Teen Titans Go! really surprised me with this one. The humor is just so much better than you would have expected based on the show. We’ve gotten glimpses of what the show could be like from time to time, but to actually pull this off for over an hour straight? I couldn’t help but be impressed. Aside from the Slade humor being a bit weak I can’t think of any negatives for this film. Even if you haven’t seen the show before now I highly recommend checking this film out. It’s just a lot of fun and all you need is a basic understanding of DC comics or at least the comic book movie industry to really get into what’s happening here. Who knows, maybe you’ll be able to accept Robin as a real hero! 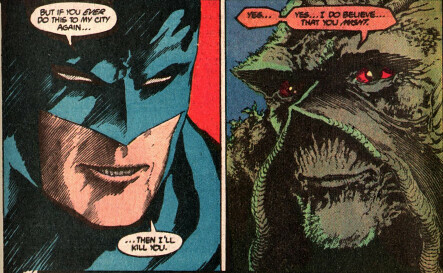 This is a tribute to both the Swamp Thing film and the 2nd Batman Unlimited title. It ended up working out as a double tribute because Swamp Thing looked pretty bad in his film while Batman was giving people the work in his. Swamp Thing is pretty tough since he works with the Green and has a good amount of super strength. Still, it won’t be enough against Batman and his many gadgets. Once Batman pops on his GL Power Ring then the match is really over. Batman wins. It’s time to look at the next Batman Unlimited film! The first one was pretty solid so I would expect nothing less from the sequel. It’s nice to have a Batman film that feels more like the classic days. It’s a bit of a cross between something like Brave and the Bold and The Batman in terms of atmosphere and character designs. It all works pretty well and the film delivers on what it promises, a lot of action with a good story behind it. The film kicks things off with a new character who has joined the fray. Gogo is a genius who likes building VR games. Unfortunately he is confronted by his co-worker who tries to destroy him. Gogo quickly figures out that she is actually a robot who is pretending to be his friend, but this knowledge is not enough to turn the tables. Even Batman is unable to save him from this menace. It turns out that the robot is working for Joker along with other villains like the Scarecrow, Solomon Grundy, and Silver Banshee. For once Batman realizes that he can’t defeat all of these foes on his own so he decides to call in Green Arrow, Red Robin, and Nightwing. Together these heroes will have to save the world! In a subplot, Cyborg is still adjusting to his new boosters. Unfortunately he doesn’t have much time to do so because a virus has infected the city and as Cyborg doesn’t have too many security firewalls he is quickly taken over. I’ve already talked at length about how Cyborg is a Teen Titan and not a Justice League member so I won’t go into that here, but this movie doesn’t help his case. I figured that the whole point of being half human and half machine was that the human side could help him fight against viruses and such. That never seems to be the case so he might as well be all robot then right? Technically Cyborg is very strong, but none of that matters if villains can just hack into him every day. This film is naturally pretty light hearted as you may expect although it does get some serious scenes. The intro where the robot tries to murder Gogo is actually played pretty seriously. Likewise, the film isn’t afraid to have some real fights thrown in and the animation is pretty solid. It doesn’t really have any choreography and the fights do tend to get paused for quick one liners and such, but the film looks good when it actually tries. It’s a nice animation style and works well enough for the film. Unfortunately the soundtrack is basically nonexistent so don’t expect to remember any of the tunes by the end. This just isn’t quite that kind of film. The humor isn’t bad for the most part. It can feel a little forced, but it could be a lot worse. I’d give the writing a pass. Then we have a nice Matrix homage near the end as Batman and Joker fight in the Cyber World where they each have to corrupt the other. It’s a battle of wills so naturally you’re never too worried for Batman. He’s not going to lose when it boils down to a fight of resolve. The pacing is pretty good for the film as well which makes sense since it’s so short. At most you may find it a bit redundant how the heroes keep beating the villains, only to have them escape for another round. I feel like this happened at least 3 times. The villains just wouldn’t quit which is admirable but then there’s no reason to think that the rematch would go any differently. Joker’s robot at the end was pretty cool though. If not for a serious amount of plot hax he definitely would have won in the end. All he had to do was actually try moving so Cyborg couldn’t hit him and then it would have been all over. Maybe deep down Joker actually wanted to lose. That would be quite the twist eh? The movie also decided to go with a pretty interesting set of characters here. Batman is an obvious pick of course and likewise for putting in Tim Drake as Red Robin. While the latter is treated as comic relief a little too much, he still gets the job done. For Batman, while I mentioned that the animation is solid I have to admit that Bruce Wayne looks very off. It’s something about his human design that makes him look like a character out of Space Dandy or that crazy future 90’s aesthetic. Not a bad thing, it’s just different. Nightwing is another good teammate to have around and while there’s not much in particular to say about him, I do like how the film turned his trope of self doubt on its head. When Scarecrow tries playing the mindgames Nightwing doesn’t fall for it. As he said, he got over that a long time ago. Then we have Green Arrow who does his best but as always he seems to be a step behind the others. After all, he’s just as rich as Batman, but doesn’t have the hand to hand skills or large array of gadgets that the Dark Knight possesses. As for Cyborg, he was getting mind controlled the whole time so while he is a nice guy there isn’t much to say about him either. As for the villains, Silver Banshee was fun. Her ability is always pretty lethal against most opponents since they will actually get older which can’t really be undone. Solomon Grundy is still the power hitter, but he’s never the most enjoyable villain since he isn’t too smart. The film did a reasonable job of not making him too annoying though and dressing up as the pizza man was smart. Scarecrow was pretty good here. He was a legitimate threat and kept the heroes on their toes throughout. This was also one of Joker’s better outings easy. He balanced out the humor and serious traits of his character well and as always his plan took Batman to the edge. Overall, Batman Unlimited continues to be a solid series. I look forward to seeing how the third film fares. If you like action films or just want to see some light hearted fun then I would recommend this film. What you see is what you get so there are no real surprises here, but the plot is executed well. You’ll be kept entertained all the way through and since this is one of your only chances to see Red Robin in action, how could you miss it? With a solid blend of writing and animation, this is definitely a complete film.